- Piracy is spreading all over. The succesful hi-jackers are quickly turning into some kind of Robin Hood figures, who are giving lessons how to take from the rich and give to the poor. The last face of our preparations for a longer passage is looking for weather and deciding on the exact date of departure. We have been doing that for a couple of days now. - Murphy pays a visit. Our fridge and freezer breaks down the evening before we are receiving guests from back home! Not only are we forced to serve non-alcoholic beer (all alcohol is banned in the Maldives), which we can live with, but now we have to serve it warm, which may be difficult to live with. Room temperature here is minimum 30C, so it will be a challenge to keep any food on board also. And as I have explained elsewhere on this web site, the resorts in the Maldives are not welcoming to cruisers. Catering will be a challenge indeed. Take a look at this link: Wife shoots husband dead for giving her warm beer. - To the Med at any Cost. Maybe you think I've written too much about piracy already. Yes, but I haven't said enough. 1,200 tropical islands - 1,000 of them uninhabited, crystal clear water, abundant marine life, great weather and very friendly people. A cruiser’s paradise, you may think? Not entirely so, unfortunately –the government of the Maldives does not encourage private cruising in their archipelago. 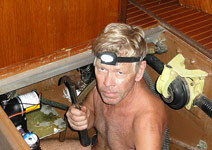 - If you are serious about sailing across the Arabian Sea, you should hire a group of armed security guards. I received this message by e-mail from the commander of one of the Coalition warships. Could it be more plainly expressed; ordinary sailing yachts cannot expect any assistance from the Coalition Forces, who are patrolling the area by 30 warships from a dozen of nations of NATO, EU and others. Landlubbers, imagine calling the police on 911 for protection from robbers on your door step and they advise you to employ your own armed security guards instead. 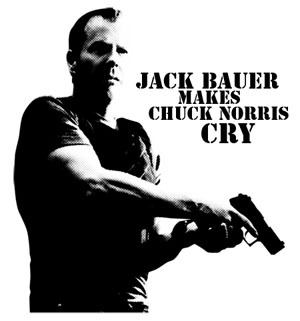 If you wonder who Jack Bauer is, don’t read any further, this story is wasted on you. All we need is Chloe directing satellites on all motherships used by the pirate groups. Then Jack can either be dropped paragliding from high altitude or popped from a submarine. He takes out the ships one by one and in 24 hours this ridiculous situation will be over and the Indian Ocean a safer place. All of a sudden, we are finding ourself in a tricky situation. I feel a bit like the guy who was painting the floor and found himself in a corner without escape routes. Well, we didn't catch the 11.1.11.11 -train. But it appears that we will finally start tomorrow on our final 5,000nm voyage getting back to the Mediterranean, which we last left 11 years ago. 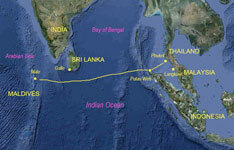 The trip will take us from Thailand to the Maldives (1,600nm), then across the Arabian Sea to Oman (1,000+nm depending on route), through the Gulf of Aden (GoA), the strait of Bab-el-mandeb into the Red Sea and further to the Suez Canal and Port Said (1,000+nm). The last leg from Egypt to Turkey is only 500nm I guess. As you know, the real challenge on this route is piracy. Until recently the most dangerous area has been GoA, between Salalah in Oman and Aden i Yemen. We have been focusing on this challenge and mentally prepared us for this roughly 700nm long stretch. Unfortunately, the rules have changed! 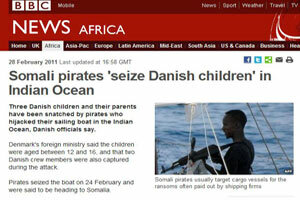 Since November 2010 the pirates have successfully used at least 5 captured ships as mother-ships enabling them to operate several thousands of miles from Somalia. Some of these hijacked ships have completed multiple patrols since they were captured. Only about a year ago (November 2009) the eastern boundary of the High Risk Area was considered (www.riskintelligence.eu) to be around 62E (see map below left). 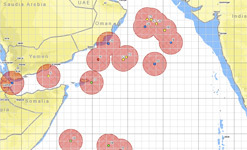 Just a few days ago (January 10, 2011) Nato Shipping Centre issued an alert map showing recent positions of pirate attacks as north as 21N and east as 64E (see map below right). Eye witnesses describe attacks in small fast skiffs with larger (mother ships) in the vicinity. 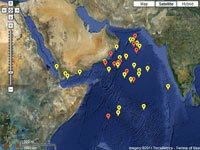 According to the Danger of Piracy guide lines published by The International Sailing Federation ISAF, in co-operation with the MSCHOA (Maritime Security Centre - Horn of Africa) set up by EU NAVFOR (EU naval force) Operation ATALANTA, the risk area stretches all the way to 10S and 78E (which is the southern tip of India)! I find it impossible to understand why the coalition forces, formed by dozens of battle ships from many countries, cannot stop these mother-ships. They are giant freighters, for crying out loud, impossible to hide and easy to identify. Why don't the navies just drop a bomb on each of them? Anybody in command of a highjacked ship must be presumed to be guilty of piracy. As a matter of fact, I think the pirates have made a mistake by implementing this new strategy. This should give the counter-piracy forces new opportunities, which, sadly, they do not appear to be taking advantage of. Ok, if the pirates are using hostages as shields, maybe we cannot shoot the ships to pieces, but it should be a piece of a cake, with modern technology, to either put a shadow on each ship or put a tracker on them by satellite. Knowing the exact position of these bastards should make it easy for the coalition forces to be in the vicinity and prevent attacks. I borrowed the title of this post from a great review by Jeffrey Gettleman in The New York Review of Books. An even more promising departure date, don't you think (see previous post)? Only 11.11.11.11 would be better, but early November is not a good time to start on this passage - the weather would not be suitable. Our departure from Phuket to the Mediterranean has been delayed several times now. Interesting how these last minute problems (and misfortunes in general) happen in clusters. We've had both medical and mechanical incidents. First I got this inter vertebral disk injury; a terrific pain in the small of my back combined with severe electric-shock-like pain running down my leg, which lasted for maybe 10 days although I ate 2000mg of ibuprofen a day. Then I fell over on a slippery concrete dock (with a big bag of groceries in each hand) and hurt my elbow. A week later thick, yellow, sticky fluid started to drip from the wound. Some kind of cell fluid I guess, didn't look like abscess. I decided to start an antibiotic cure to be on the safe side anyway. Next, I flew out of the dinghy in the surf at a beach and landed on my back on the hard sand (not the same side of the back as the previous back injury). Moving around is very painful, but I hope it's only an impact on a muscle. Luckily the dingy and outboard didn't submerge, as they did last year in the same spot. A severe touch of lip herpes didn't help making my mood much better. One of our mechanical problems worth mentioning is the break down of the engine control. 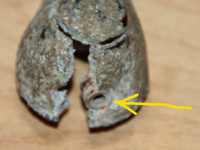 Again a prime example what corrosion between two dissimilar metals (aluminium and stainless as usual) can cause. What always amazes me, however, is how skilful machinists you can find almost everywhere. Pretty much anything can be fabricated in a machine shops with basic tools. Look at the photos above (click-on for larger image). To the left is the original lever (or what is left of it) of my Morse-control. To the right is the new piece a Chinese machinist made me in a couple of hours for €35! In the middle is a close-up of the stainless set-screw which broke the cast aluminium handle. On the photo below you can see our temporary arrangement. Back to the heading of this post: Our latest take-off date is now 11th of January 2011 at 11:00, the day after tomorrow. No, the header is not data code. Happy New Year to all. As you may know cruisers tend to be superstitious. For instance, you never start on a voyage on a Friday. We have recently had some bad luck, so we thought it would be wise to choose a good departure date on our journey across the Bay of Bengal, The Arabian Sea, The Gulf of Yemen and the Red Sea, much of the route known today as Pirate Alley. We decided on 1.1.11.11, which of course is the code for 1st of January 2011 at 11am. Unfortunately Murphy appears to be persistently aboard Scorpio lately. On New Years Eve our bilge pump broke down and as if that wasn't enough, our primary navigation/communication computer started to have trouble with respect to conflicts between the com-ports of our chart program (running C-map) and our communication program (Airmail controlling SSB-radio via SCS Pactor 3 modem). Therefore we didn't succed with the 1.1.11.11, instead I spent 5 hours in the bilge this day installing a new bilge pump, that I had bought as a spare unit "just in case" (excellent planning, if I may say so myself). Problem was, that I had not been able to get an identical pump, here in Thailand, to the old one. 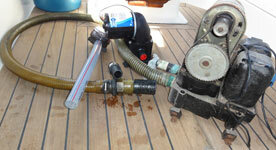 This one had 3/4" (19mm) hose connection ports instead of the 1" (25") ports on the old one, and all hoses around the bilge are 1". 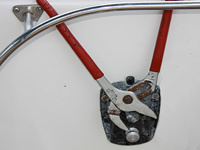 For the best part of our nearly 20 years of sailing I have been carrying around an enormous amount of pieces of various hoses "just in case", but during our recent refit I decided to free up some space and threw them all away. Bad planning! Fortunately I had some step-up/step down hose connectors on board, but I desperately needed half a metre of 3/4" hose to be able to connect the pump to the thinner side (3/4") of the connectors. Just a few weeks ago I had replaced the hoses to our showers' sump-tank pumps, which actually are 3/4" in diameter. I decided to cannibalise on one of these (we have both manual and electric pumps in all locations anyway), but in the end I didn't have to sacrifice the sump-tank pump. It turned out that I had used about half a metre too much hose on it and was therefore able to cut off just the piece I needed without compromising the sump-tank pump. What about the computer problems? Well, I hope to get them sorted out on the way. Charts and communication is pretty important on the route we are taking during the next 3-4 months. There's no help to be found on that track. 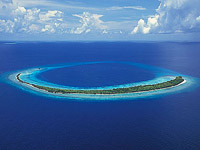 Anyway, we'll try to set sail towards the Maldives again tomorrow, even though there's little magic in the date. But it's better than waiting until 2.2.22.22. Using waste, Swedish city Kristianstad stops its fossil fuel use, according to NY Times. 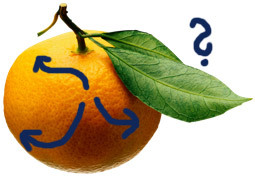 But not by substituting old technologies by solar or wind, instead it generates energy from a motley assortment of ingredients like potato peels, manure, used cooking oil, stale cookies and pig intestines! However, before any trash can be recycled, it has to be separated from other kinds of trash. Here is where every human being on the planet could join in. Having spent much of the past 18 years in the developing world and seen an enormous amount of garbage, I think that re-use of trash might be one of the most over looked strategies for a more environmentally sustainable change. 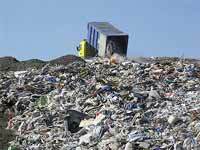 Garbage recovery slows climate change, reduces the burden on landfill sites and saves raw material resources. Unfortunately people in most developing countries show, in general, absolutely no interest in keeping their neighborhoods clean and tidy. Trash is literally thrown out of the windows on one's own back yards. There has to be an incentive for recycling. 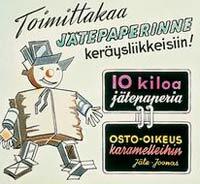 When I was a kid in the 1950-60's, paper recovery was an enormously popular hobby. 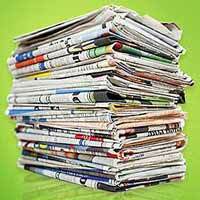 We ran around the town collecting piles of used newspapers. Everybody participated, particularly kids and housewives. You got paid per kilo and when you had enough reward coupons you could claim your rewards. 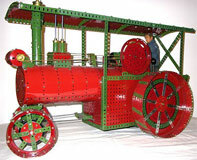 The English Meccano engineering toy kits were particularly popular among us boys, but there were much else on the price list, things like watches, dolls etc. Why couldn't a similar program be successful today, when some cities are almost drowning in litter? I doubt that even China has any national garbage recovery scheme. Plastic, bottles and metal cans are the most depressing items. In Finland I think almost 100% of cans and bottles (glass and plastic) are recycled. That's because there is a relatively high deposit on these. Here in Phuket, Thailand, were people mostly drink bottled water, there must be millions of small plastic bottles consumed every year. They all end up in the dump, but worse, a large number is just thrown away on the streets and on the beaches. I guess landfills in the developed world are in general well run operations. However, landfills are the oldest form of organised rubbish disposal and really a terrible waste (ha-ha) and should be decreased by waste reduction and particularly recycling. Problem with the developing world is that a large amount of the trash doesn't even reach the dump and even the part that is brought there is not separated. In the Bay Islands of Honduras we saw trash being loaded onto a large barge, which was then towed about one cable length (less than 200 metres) from shore and all trash was dumped in the water above the pristine coral reefs - one of the best diving locations of the world. Bahia de Caraques, a town in Ecuador, calls itself the Eco City because it has two kinds of trash bins. They are of different colours, one yellow and one green. We were never able to find out what the rules were and we never saw anybody separate anything. However, we put our organic waste in the green and plastic, cans and bottles in the yellow - until we one day saw the pick-up by the garbage truck: both bins were emptied in one heap on the platform. Recycling is educational. When people have the incentive to participate they will gradually clean up their own micro-environment and realize that is a win-win activity, helping to save the world. 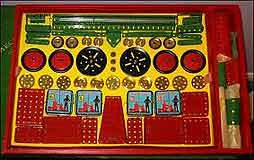 And I wonder how many boys were inspired to take up technical careers because of the Meccano set they earned by collecting paper for recycling?